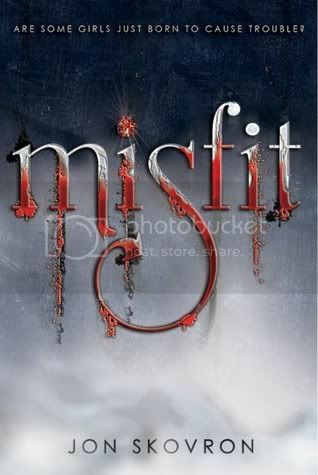 Misfit was quite an interesting read for me. I didn’t really know what to expect when I started it, and I really don’t know what to think now that I’ve finished it! It’s definitely a unique read. The main character in the story is Jael. I found her character to be interesting, even though I didn’t feel that connected with her. She definitely went through a lot in a short period of time, and I think she handled it pretty well, for the most part. Jael’s father, Paul, is another character that was hard to connect with. He seemed like such a hard man, even though we do get to see some softer sides of him towards the end of the book. My favorite characters of the book would have to be Rob, and Jael’s uncle Dagon. Both were really great characters. I wanted to know more of Dagon’s story, as well. The one character I didn’t care for is Jael’s friend Britt. She was a very bad best friend. Towards the end of the book, we see a little of why she’s that way, but the way she acted and treated Jael still made me not like her. The book has quite a bit of Christianity talk. That didn’t bother me, but it’s definitely something to keep in mind if it bothers you, and you do decide to read the book. It does, however, set the background for the book and makes it more interesting. The book was well paced, and the storyline was very creative. I did have a hard time keeping my attention on the book at times. But at some times, I just had to keep reading to see what was going to happen. Overall, I thought this was an ok read. I think I would have liked it more if I had been able to connect with the main character more. I've heard very mixed things about this but I'm glad to know that it's ok. I'll probably read it but not anytime soon! Sorry that characters fell flat for you! I agree it is definitely an interesting and unique read. I found Britt to be incredibly annoying too, I kind of just wanted to slap her! But, the rest of the story was so fascinating, crazy though. I had a similar feel. I enjoyed the historical flashbacks more than the present. I wasn't quite sure how I felt about this one either, it definitely left me a little uncomfortable but I had to appreciate how different the story was. I wish we had gotten more on her uncle Dagon, I really enjoyed his character:) Really nice review Christy! The quite a bit of Christiany stuff has me on the fence. I saw another review saying the same thing... Not sure if I'll actually read this one thought. Thanks for the honest review, Christy. I’m an author and illustrator and I made some awards to give to fellow bloggers whose sites I enjoy. I want to award you with the Best Books Blog Award for all the hard work you do! I've been meaning to read this one for a while. Glad you liked it enough, but sad that you didn't like it more. I'll get to it eventually, but maybe read other books first.